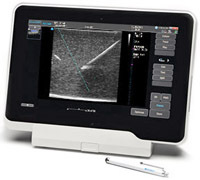 Why is the uSmart ultrasound tablet ideal for PICC Line Procedures? A PICC line can be used as a reliable way to administer antibiotics, pain medicine, chemotherapy, and nutrition, or for the drawing of blood samples. They are inserted by a physician’s assistant or certified nurse using ultrasound technology at the patient’s bedside to visualize a deep, large vessel in the upper arm. While there are other types of central line choices, PICCs are often preferred due to the convenience of insertion and removal as well as avoidance of some of the more serious insertion related complications of chest or neck placed lines.